Another very simple reicpe for pasta, something you can make as a quick improvised dish for your guests. This recipe comes from the 80s, when cream was widely used in our recipes. 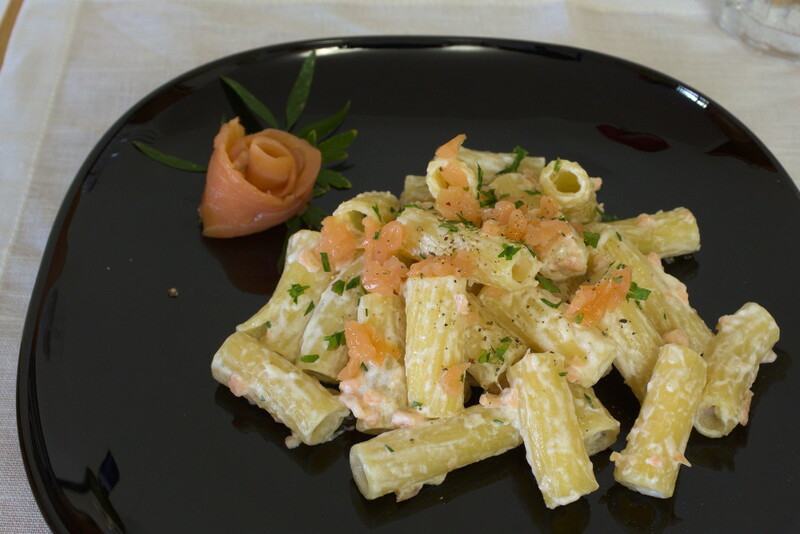 It softens the intense smoked flavor of the salmon and perfectly balances the dish. You should really try it, you won’t regret it. An easy, quick but full of taste italian recipe directly from the 80s. 160 -200 gr of pasta. 0.2 lbs of Smoked Salmon. A quarter of a small onion, finely chopped. Cut the smoked salmon into stripes, then the stripes into squares. Sautè the finely chopped onion with butter, and let it cook for a few minutes, until it gets golden but not burned. Add the salmon cubes (save some for garnish), and cook at very low heat. Add the whiskey to the pot, and once completely evaporated, add the cream. Let it thicken for a minute or two then turn the heat off. Cook the pasta (in this case maccheroni) in salty boiling water, and once “al dente” drain it and place it on the frying pan and cream it at high heat for a minute or two. The cream should thicken enough to stick to your pasta and the salmon. Serve with a little raw smoked salmon cubes as garnish, fresh dill and if you like it, a grind of pepper on top.